Dining at O’Reilly’s Rainforest Retreat, you will have three options; O’Reilly’s Mountain Cafe, the Dining Room and the Rainforest Bar are open for all of our guests including day visitors. Located above reception, you’ll have the chance to put your feet up after a long day of activities and exploring in front of the log fire. Choose from a delicious selection of Entrees, Mains and House Baked Pizza whilst enjoying your favourite beverage. Be sure to take in the spectacular sunset view from our balcony and then stay a bit longer to watch the stars come out. The bar is open from 4:00pm with Cocktail Hour starting at 4:00 and finishing at 5:30. Don’t ask… It’s an Irish thing. The Dining room is the heart and soul when dining at O’Reilly’s, offering delicious food and a good selection of wines including our very own O’Reilly’s wines. Recount your day’s adventures with fellow guests and plan the days ahead over a hearty meal. Share your dining experience with the wildlife of Lamington National Park, where at breakfast you will find masses of colour in the bay windows as the Regent and Satin Bowerbirds come in for a bath. At night you may spot a Brushtail Possum or even a Sugar Glider! The Dining Room is open for breakfast and dinner daily. If you intend on dining at O’Reilly’s, please note that we do not take bookings. Upon arrival, we will get you a table as soon as one is available. Breakfast starts: 7:30am, please be seated before 9:00am. Please note that between 6:30pm and 7:30pm there can be a wait if it is a busy night. 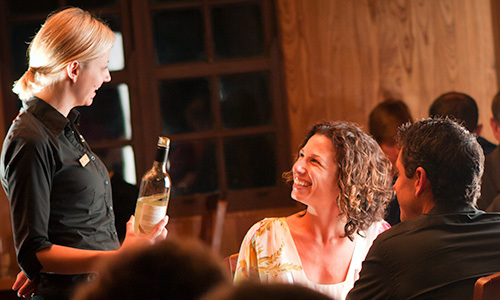 O’Reilly’s Mountain Cafe is a popular spot when dining at O’Reilly’s Rainforest Retreat. 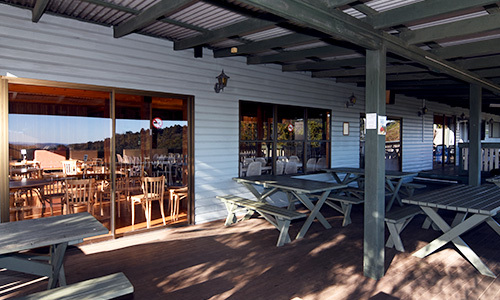 O’Reilly’s Mountain Café is fully licensed and is very popular with day visitors. For decades, O’Reilly’s guests have stopped in for a warm cup of tea and scones after the scenic drive the mountain. Previously known as Gran’s Kitchen, the cafe has evolved over the years but has remained a place where hikers rest their legs, recharge and admire the expansive views down through the valley towards the mountains of the Scenic Rim. The menu offers lunch or lighter options including great coffee and cakes. You can even treat yourself to a glass of O’Reilly’s Canungra Valley Vineyards wine. Full a la carte menu is available daily between 11:00am – 2:30pm, with light options available all day between 9:00am – 4:00pm including weekends and public holidays. Please note: the kitchen closes at 2.30pm daily. Drinks and snacks are available from next door at the Mini Mart and Takeaway, including a range of essential items for self-catering in the villas. The cafe and gift shop will be open 10:00am to 2:00pm on Christmas Day. 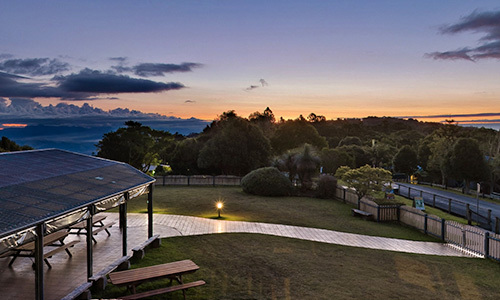 Stop in for a drink at the Rainforest Bar to view the spectacular sunset over the westerly ranges. Located above reception you’ll have the chance to put your feet up after a long day of exploring and enjoy the log fire and sunset views. The bar is open from 4:00pm with Cocktail Hour starting at 4:00pm and finishing at 5:30pm. Don’t ask… It’s an Irish thing.